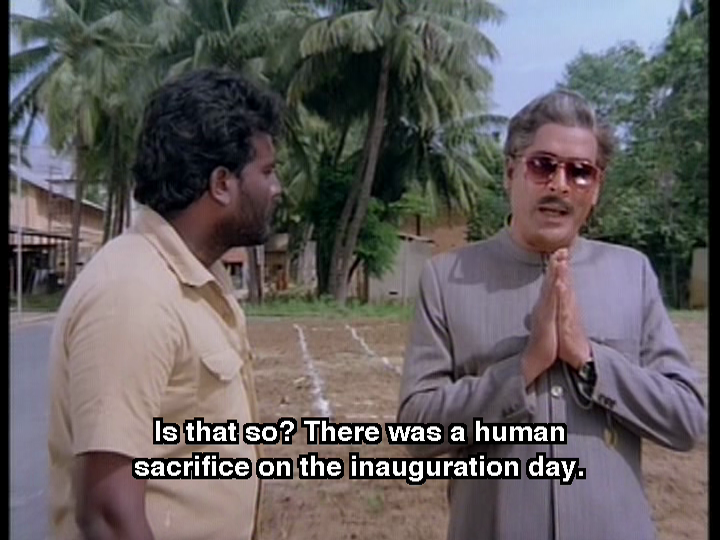 I like a good socialist masala film. 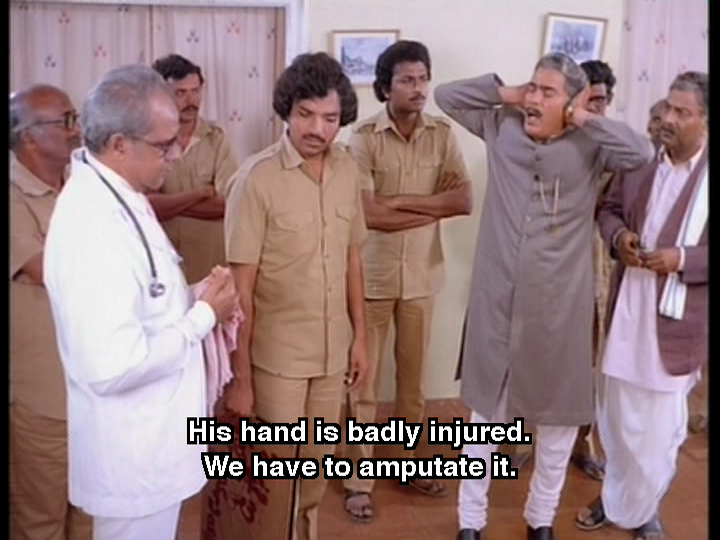 Sangarshana has surprisingly long interludes of sensible decision making and logical plot progression, plus loads of dancing and a very good cast. It’s highly entertaining and while the plot is fairly basic, it’s more rounded out than I expected. Lest that all sound a bit too straightforward, there are mysterious mute women, children separated at birth, a comic sideplot that hinges on romantic sabotage, family dramas, medical emergencies, flying somersaults, fight scenes and a bit of conflict resolution through disco. 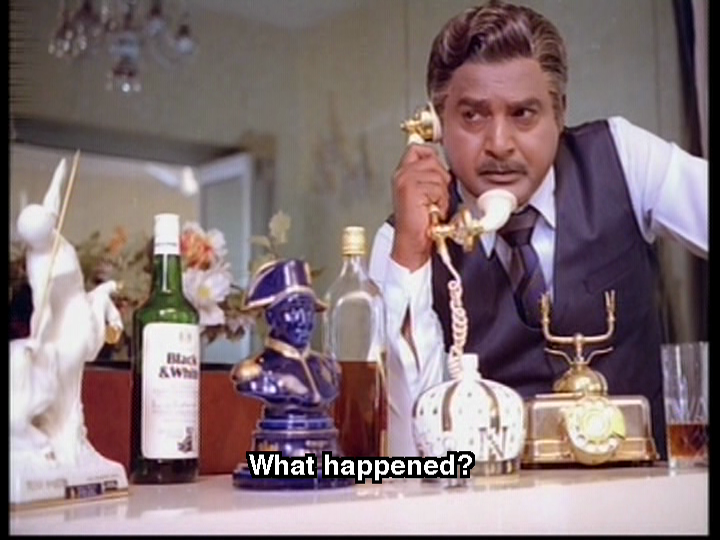 Dilip (Chiranjeevi) returns from America to live with his wealthy industrialist dad (Satyanarayana Kaikala). He is a nice enough guy but used to the easy life, and can’t really understand the struggle of workers in his family factory. He believes his dad is a good guy and that the workers should trust him and remember their station in life. Eventually Dilip comes to realise that his father is more interested in money than in the means by which he obtains it. To make matters worse, the local site manager (Rao Gopal Rao) reneges on offers of compensation for injured employees and overacts wildly. My post grad studies were in Industrial Relations and I can confidently state that I never encountered that reaction to a workplace accident in any of the cases I studied. 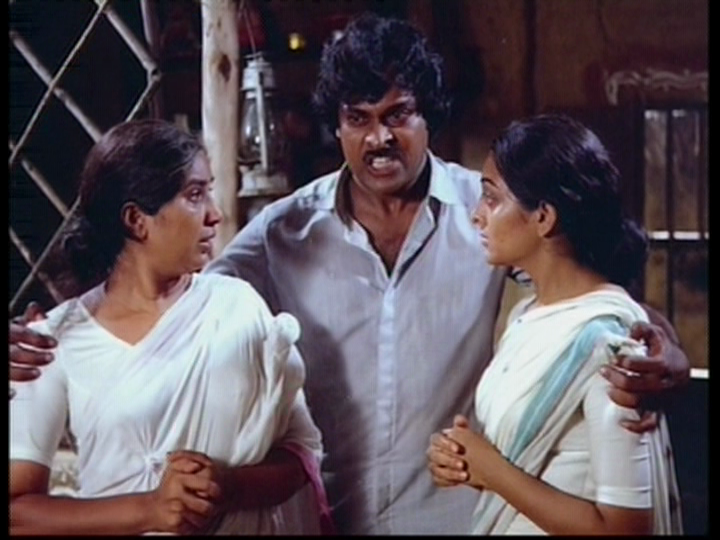 Dilip renews his relationship with his childhood friends Shivam (Sivakrishna) and Radha (Vijayashanti) and their father, the supervisor Mr Krishnamurthy (Gummadi). When he isn’t prancing about reminiscing with Radha, lifelong snappy dresser Dilip is prancing about romancing Rekha (Nalini) the daughter of his dad’s local business manager. Life is all twirling around on hilltops and dancing around trees. But then other issues start to take over. Shivam starts a union and tries to get fairer conditions for the other workers. Some of his demands seemed a bit out there (workers compensations is fine, but three months bonus? ), and fights the good fight. Unionisation is not ideal for the owners as regulation and systems may bring their smuggling sideline to light, and they certainly don’t want to reduce their profits. Once Dilip realises the extent of the illegal activities and his father’s role in the shady doings, things start to get nasty. 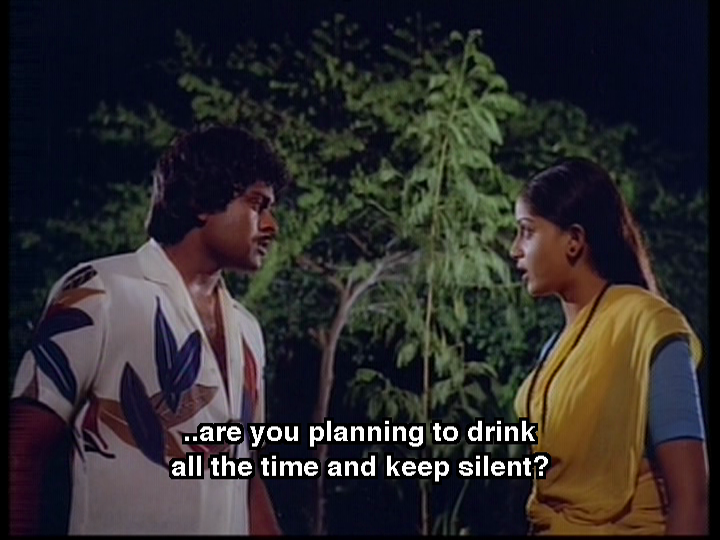 He is thrown out of home, his relationship with Rekha is threatened as her father coerces her to give up Dilip, and there is much drinking and crying. When Dilip is framed for Shivam’s murder, Chiru dials up the heroics as he becomes a furious young man and makes his enemies sorry they ever crossed that line. 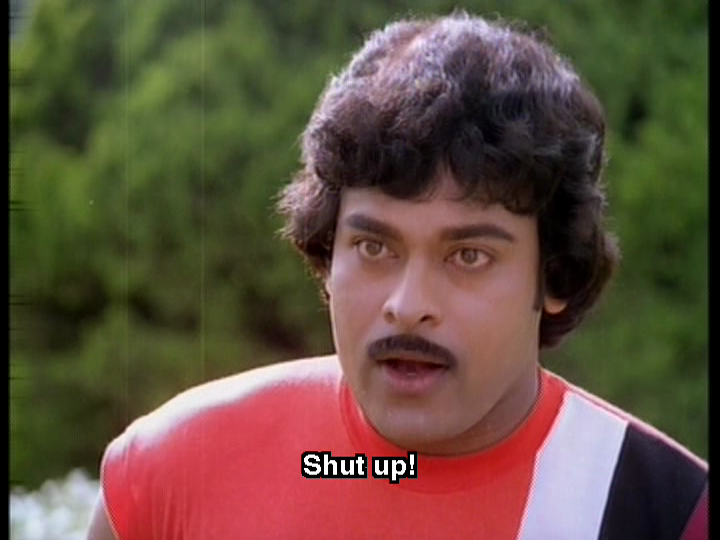 Chiranjeevi is very good as the showy Dilip who brings back expensive gifts and spouts some terrible English dialogues. He manages to be vain and likeable and the transition from easy confidence to anger and hurt betrayal is excellent. He is deliberately cheesy in some romantic scenes, adding a comic spark, but brings genuine warmth and pathos when it is needed. Oh those outfits make me weep, especially the poor backing dancers. But look at Chiru go! He dances up a storm and is handy in a fight. No wonder the ladies are lining up! 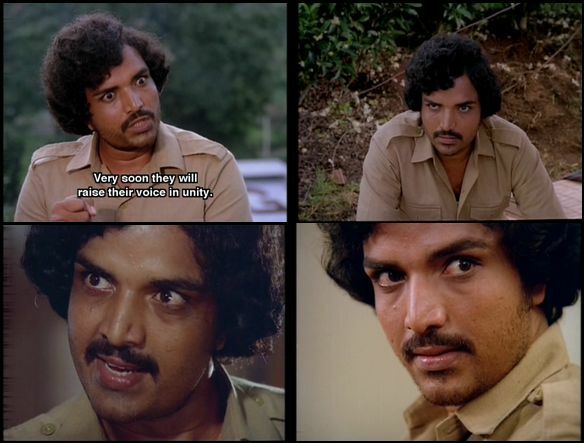 Sivakrishna has one expression for 80% of the film but since he plays an angry young man that works well enough. Allu Ramalingaiah is Varahamurthy, the comedy religious advisor who abets Rao Gopal Rao in his schemes. 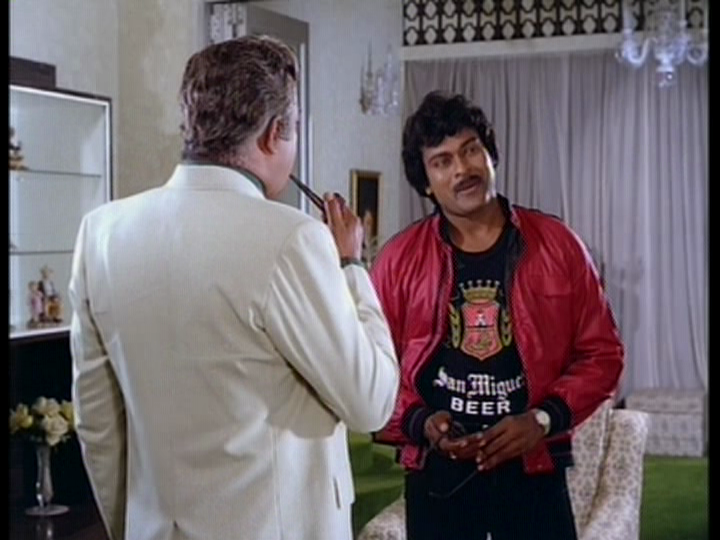 Varahamurthy has his own ideas about marrying his son Chalpai off to rich and lovely Rekha, while Chalpai has the hots for a voluptuous local girl. Those shenanigans constitute the comedy side plot and aren’t quite as painful as they might have been, although I did forward through most of it on a re-watch. Annapurna plays the mysterious mute woman who holds the key to a tangled family saga. Her revelations relieve Dilip of his sense of familial loyalty, and make him determined to bring his father and cohorts to justice. Vijayashanti is beautiful as simple village girl Radha. She loves Dilip and has a fair number of song induced fantasies about their love. But she is a sensible and nice girl who doesn’t let romantic notions carry her away. Radha is committed to her family and to doing the right thing, and doesn’t hesitate to call Dilip on his weakness when he is wallowing in drunkenness. When she sees that rich Rekha is more Dilip’s type Radha has a talk to herself and decides she has to move on. See? Sensible. 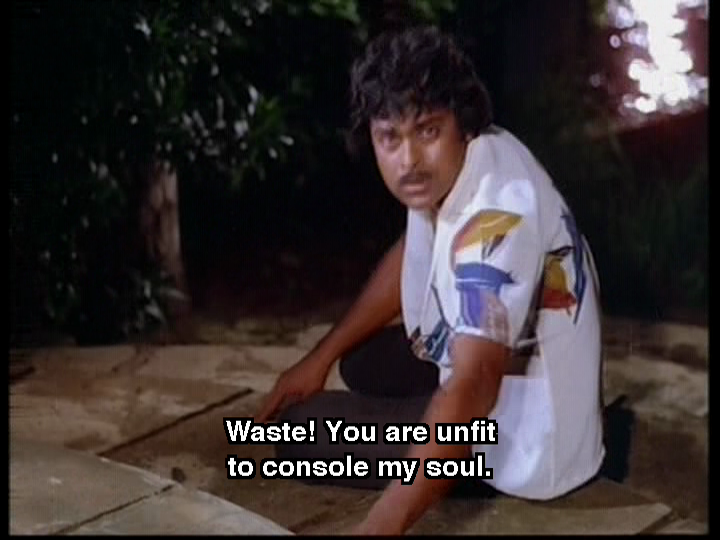 Nalini gets less emotional range but more hideous fashionable outfits as Rekha. 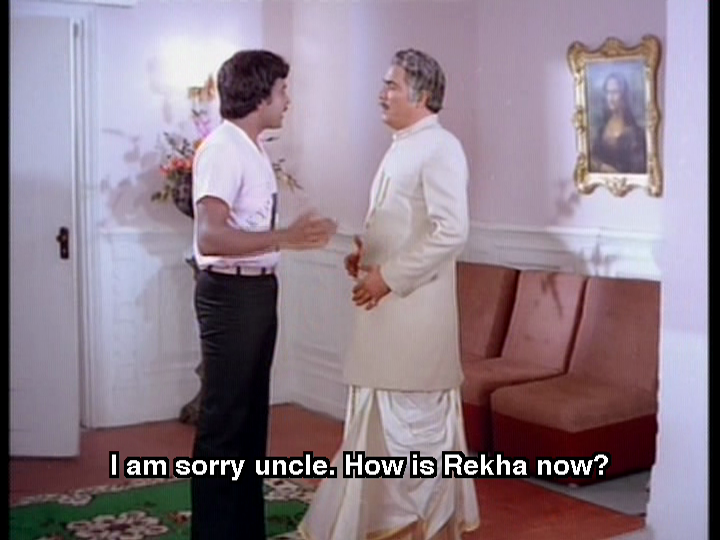 Rekha is pretty, a bit spoilt, but once she decides Dilip is The One, she doesn’t back away without putting up a fight. Literally – check her out in this clip. Nalini is good but didn’t make as strong an impression as Vijayashanti despite the biffo. K Chakravarthy provided a range of songs that suited the mood and the characters. Radha and Dilip have more traditional duets while Rekha gets a more Westernised treatment. The choreography is energetic and certainly suits Chiru who gives it his all. I love watching that song. It comes at a high point in the story and what I really enjoy is the slightly ragged energy that makes it look like people were having fun dancing and not just thinking about it as a scene. The interior sets are quite fabulous. Someone on the team decided that more is more in some cases, and I enjoyed playing ‘name that knick knack’ or ‘spot the repo old master’. The dedication to clashing patterns is also quite noticeable. 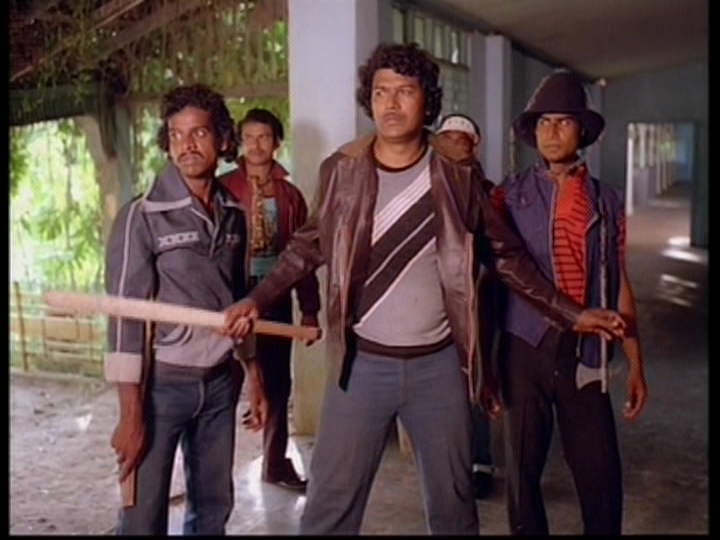 The western costumes are very 80s while the rowdies dress like a blind costume designer’s hippie fantasy. 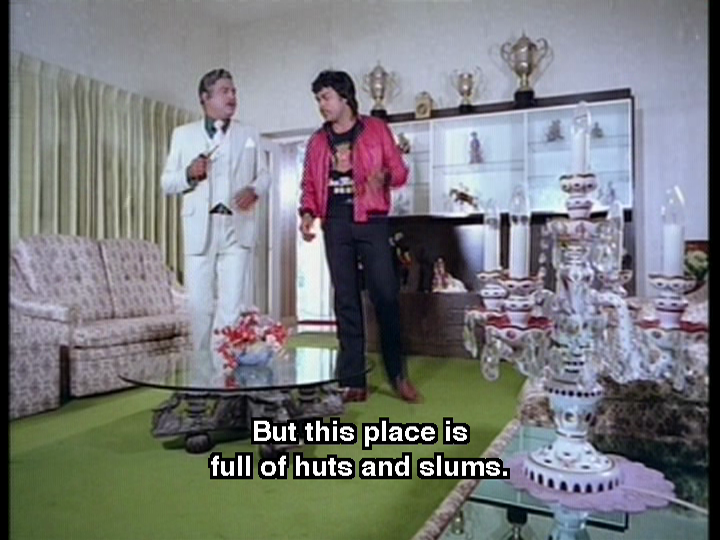 One of my few quibbles with the film is that, as a result of what I assume is slacking off by the footwear team, Dilip often wore a pair of quite drab brown ankle boots that just didn’t go with his outfits. The plot is quite cohesive and the lead characters are engaging. Occupational health and safety, security for families of workers, a fair go and collective bargaining are things I have an interest in, so while this is very filmi it does throw some ideas around. Issues are explored in conversations, but nothing too heavy. The actors deliver good performances with the right balance of craziness and heart. Director K Murali Mohana Rao keeps things moving along and the story plays to Chiranjeevi’s strengths. 4 stars! This entry was posted in Tollywood and tagged Allu Ramalingaiah, Annapurna, Chiranjeevi, Chiru, Gummadi, Happy Birthday Chiranjeevi, K Murali Mohana Rao, K. Chakravarthy, Kaikala Satyanarayana, Megabirthday 2012, Nalini, Rao Gopal Rao, Sangarshana, Sivakrishna, Telugu, Vijayasanthi, Vijayashanti. Bookmark the permalink. Wow, that one with subtitles too?